That’s what came to mind when I was thinking of how to sum up this year’s Holiday Workshops. I knew I wanted to use the snowy white owls in our Creativity Morning. So the whimsical side of me wanted to call our theme “Owl I Want for Christmas” or “Owl Be Home for Christmas”. But the classy side of me wanted a more universal name. Since the Porch Pot was designed with a charming lantern focal point, I knew I had my answer by calling our morning workshop “Silent Night”. Can’t you just imagine you and your guests walking into your home after a light snow? Everything is magically quiet, as the snow absorbs the night sounds. A calm, comforting feeling envelops you. Who knows what waits for you on the other side of the door, but for now, you remember why you decorate your home for the holidays: To celebrate the season with your friends and family. But don’t worry, I haven’t forgotten the whimsy! The biggest surprise last year was the Grinch Tree. Both the kid’s class and the full-sized version were a huge hit. People sent me loads of pictures when they got them home. There is nothing wrong with having a little fun, too, during the holidays, especially if it reminds you of the story behind that Grinch Tree. A quick glance at it as you leave your home to go shopping may remind you to be a little kinder when you find yourself in line behind the person counting pennies, or when the waitress forgets the cream for your coffee. And speaking of kindness, $5 from every Christmas Cat Wreath sold will go to The Second Chance Animal Shelter. This is a brand new class, brought to us by our friend and garden center owner in Virginia. So check out the new list, but please, please REGISTER EARLY. We are hosting over 50 private classes this season, so there may not be time for a second class if the first one fills up, like we usually do. If you’d like more info on our private classes, contact me at Tina@BemisFarms.com. In brief, you need a minimum of 10 people for a class here at the nursery, and a minimum of 15 to 20, depending on how far away you are, for a class at your place. We still have some mornings available, and a few afternoons. Most of the evenings are already booked until December 12th , but it never hurts to ask. We start booking classes a year in advance, so if we can’t work something out this year, you can get on the calendar for next year! Bring a Friend, Have Some Fun, and Leave the mess behind! Design in the authentic style of Williamsburg, VA using shiny magnolia leaves and bright red apples. Staying authentic, we use only ingredients available during Colonial times; Pods, berries, cones and feathers all work, but no ribbons or gold, (unless you want to be a rebel!) as these are considered Victorian-style. Perfect as either a centerpiece or door decoration. You can even tuck a taper candle in the middle, and it can do double-duty! A centerpiece for Thanksgiving, and for a wall or door after. 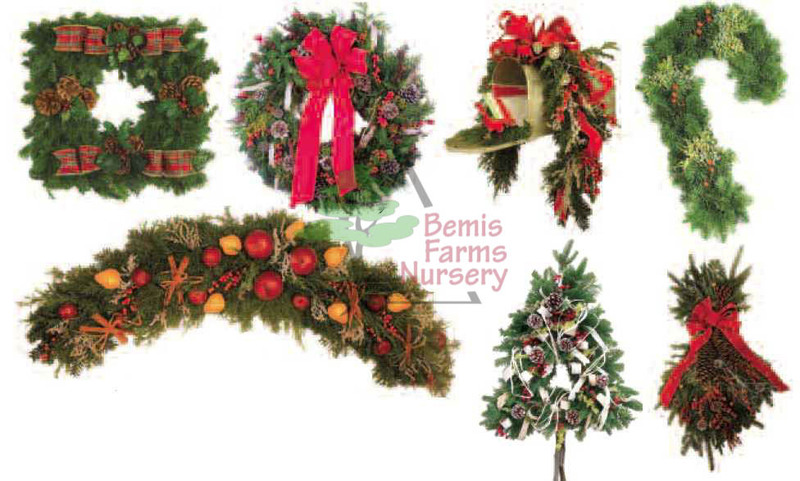 Create a curved or straight swag as you wish, from an assortment of freshly picked evergreens. If you are taking the Owl Wreath and Silent Night matching Porch Pot class, be sure to choose decorations to match, so you can create an overall theme. There will be cones, pods, berries, twigs, grapevine, dried and faux fruit and much more to select, as well as a velvet bow. It can hang above a door, under a window, or be attached to a window box. Or you can turn it sideways and hang it vertically just about anywhere. You can even lay it flat, and use it as a table runner inside on your dining room table. If you sign up for the Silent Night Door Arch, Owl Wreath and Lantern Porch Pot you get all three for $99. Essentially getting the 3rd one for half price! Your immediate confirmation email will not reflect the special pricing, but your card will be charged ONLY $99. Hand-craft a round wreath with a mixture of fresh, fragrant evergreen boughs, like balsam, cedar, and white pine. You can change your frame to a square, heart, candy cane, door arch, tree, swag, snowflake, medallion, or mailbox hugger if you would like. Along with a beautiful, white owl, we have a huge table chock full of pods, cones, berries, dried and faux fruit, ornaments, twigs and more. We have some sample wreaths for you to copy, or we can help you design your own, unique creation. No two will leave the same. If you sign up for the Silent Night Door Arch, Owl Wreath and Lantern Porch Pot you get all three for $99. Essentially getting the 3rd one for half price! Your immediate confirmation email will not reflect the special pricing, but your card will be charged ONLY $99. No need to have a bare doorstep just because it is winter. Replace your annuals with this 4 month showstopper with greens, pine cones, berries and bright twigs. Along with a snowy owl, the real showstopper here is the Silent Night Lantern. Learn clever ways to use this decoration to change your pot from average to spectacular! We have a huge assortment of pine cones and pods already attached to sticks, so you can spend your time creating, and less time on wiring. 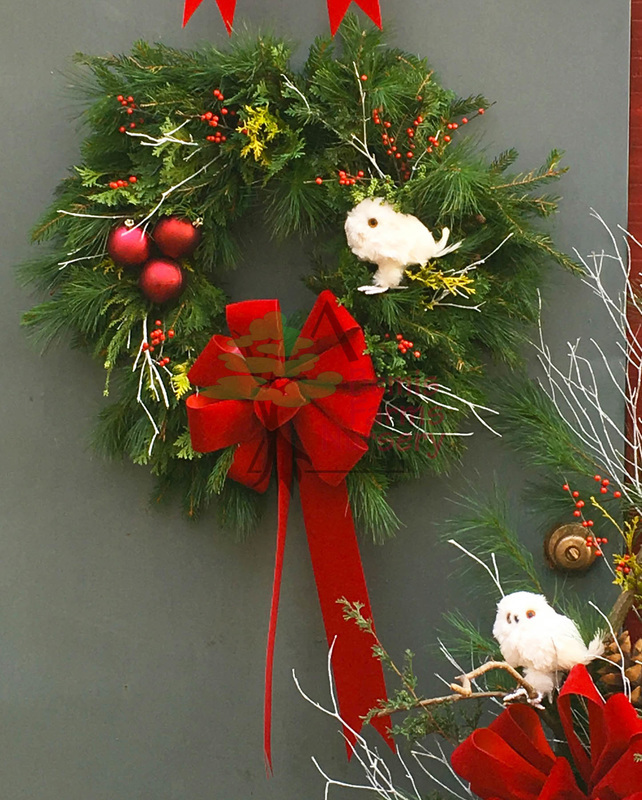 If you sign up for the Silent Night Door Arch, Owl Wreath and Lantern Porch Pot you get all three for $99. Essentially getting the 3rd one for half price! Your immediate confirmation email will not reflect the special pricing, but your card will be charged ONLY $99. Hand-craft a round wreath with a mixture of fresh, fragrant evergreen boughs. 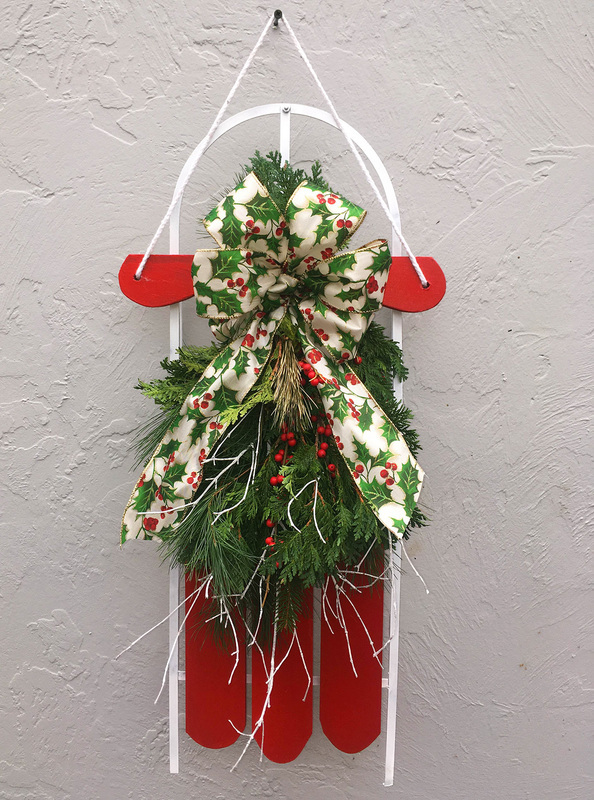 Includes a velvet bow for those who simply want the beauty of the evergreens to stand out. Add-on #1: Think outside of the circle! Change your frame to a square, heart, candy cane, door arch, tree, swag, snowflake, medallion, or mailbox hugger for an extra $5. No need to decide which shape now, this upgrade covers any one. (You can also upgrade at class if you change your mind.). Add-on #2: For those who want all the bells and whistles (or berries and cones!) you can decorate your wreath for $10! We have a huge table chock full of pods, cones, berries, dried and faux fruit, ornaments, twigs and more. We have some sample wreaths for you to copy, or we can help you design your own, unique creation. After years of looking at hundreds of showrooms at the Atlanta Gift Show, I finally found a reasonable-priced sled to get decorated and go on a door, or on a doorstep. The last time I had this class it was sold out quickly. I have a limited number of sleds, so SIGN UP EARLY if you want one! You are welcome to bring your kids with you to this class, but we've found that just because we've grown up, we adults still secretly adore all the magical, whimsical things about Christmas. This three to 4 foot tree (you decide!) includes a huge selection of baubles, balls, stars, and swirls, that were surely some of the stuff that Dr. Suess used as inspiration. 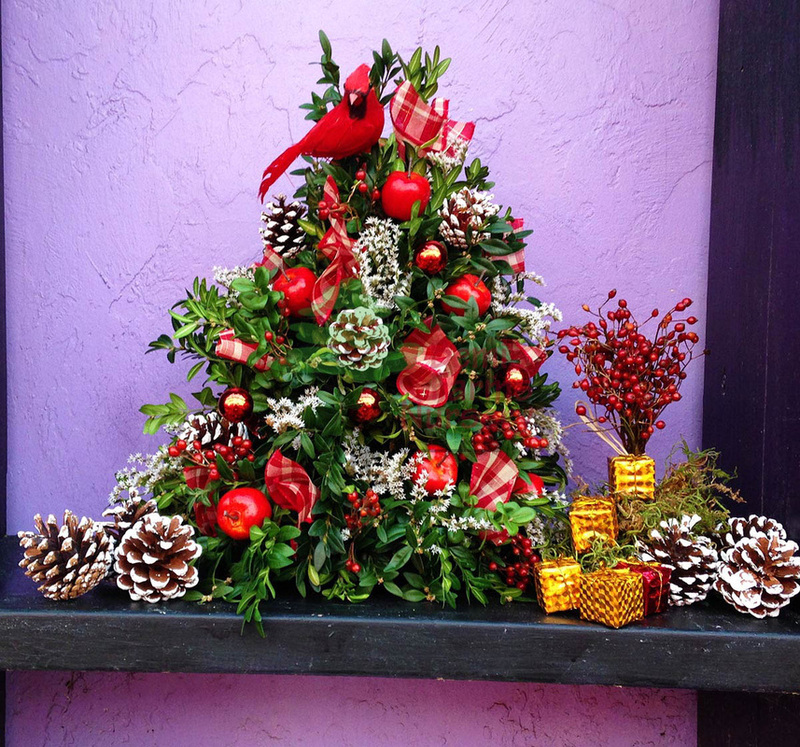 This is perfect as an outdoor porch pot, and can also be used inside as a Christmas tree. Everyone LOVED this last year, and sent us their pictures from their homes. 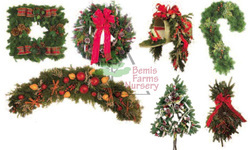 Create a curved of straight swag as you wish, from an assortment of freshly picked evergreens. If you are taking the Owl Wreath and Silent Night matching Porch Pot class, be sure to choose decorations to match, so you can create an overall theme. There will be cones, pods, berries, twigs, grapevine, dried and faux fruit and much more to select, as well as a velvet bow. It can hang above a door, under a window, or be attached to a window box. Or you can turn it sideways and hang it vertically just about anywhere. You can even lay it flat, and use it as a table runner inside on your dining room table. If you sign up for the Silent Night Door Arch, Owl Wreath and Lantern Porch Pot you get all three for $99. Essentially getting the 3rd one for half price! Your immediate confirmation email will not reflect the special pricing, but your card will be charged ONLY $99. No need to have a bare doorstep just because it is winter. Replace your annuals with this 4 month showstopper with greens, pine cones, berries and bright twigs. Along with a snowy owl, the real showstopper here is the Silent Night Lantern. Learn clever ways to use this decoration to change your pot from average to spectacular! We have a huge assortment of pine cones and pods already attached to sticks, so you can spend your time creating, and less time on wiring. This wreath comes from our friend at Natural Art Garden Center in Virginia. I sent her a whole big box of chocolate in order to borrow her idea! $5 from every Christmas Cat Wreath sold will go to The Second Chance Animal Shelter in North Brookfield. Choosing this class is a no-brainer if you are a "Horse Person." Or make a Reindeer head for a classic yet whimsical decoration. This is much easier than it looks. In fact, it is easier than a regular wreath to make, as we do the hard work ahead of time by making your frame. Simply BRING YOUR OWN STAPLE GUN and follow along. You can choose ribbon to match your barn colors or home. Once a Victorian era decoration, these hanging globes of fresh, fragrant greens, white-tipped pine cones, glass balls, twig and ribbons now deck halls and porches across America. Put it where your hanging basket used to be, or hang it inside, tuck a bit of mistletoe in it and see what happens. Approx. 18 inches across. Learn how to craft the perfect tree shape using premium boxwood tips .Decorate with fruit and bows, to match the photo, or create your own, unique tree, in any style, from natural to glitz, with a wide assortment of decorations. The 1 pm session is sold out. There is still plenty of room in the 3 pm session! You need to see this in person. The picture doesn't do it justice. 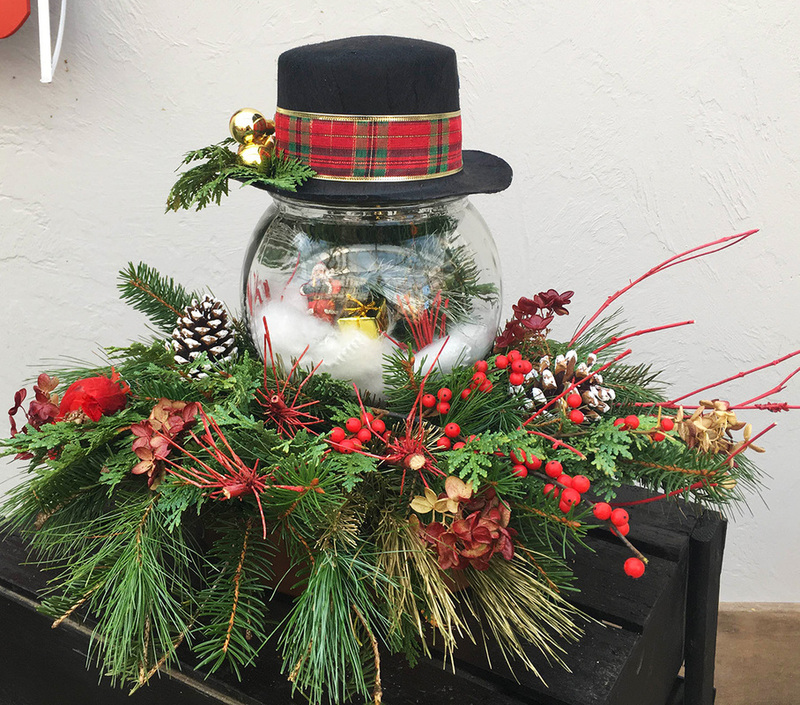 You will create a little woodland snow scene inside a glass bowl, like a snow globe, and top it off with a decorated top hat. THEN surround the scene in fragrant evergreen branches, twigs, berries, and, of course, a cute, little birdie. It's hard to tell from the picture, but this is a full-sized porch pot, 2 to 3 feet tall, depending on how big you want to make it. Icicles, 'n snowflakes surround the snowman couple with sparkly whimsy. This is the final installment of 2016 for our "940 Saturdays" Kids Classes. Because there are only 940 Saturdays from when your child is born and until your child turns 18, this is Bemis Farms Nursery's way of offering them a chance to share your love of gardening and crafting garden-related decorations. Both the time and price of class gently reminds us to spend our Saturdays doing what is important to us. The "Kid-Sized" version will be about 18" tall, and suitable indoors or outdoors. This would be a great class to add on to complete the Silent Night theme, if you signed up for the Silent Night Creative Morning. This class has already been chosen by many groups who have scheduled private classes this season, so it is sure to be a big hit.